What would you do if you knew the world was about to end? Would you go crazy every night without a care of what the repercussions could be? Would you seek out your family one last time? Would you try to find the love you thought you had lost? 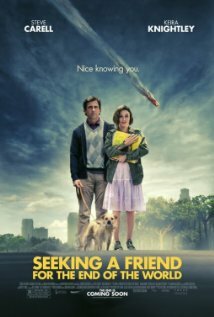 “Seeking a Friend for the End of the World” presents audiences with a variety of different routes one could take in a sometimes funny, often very sweet look at one man’s journey to find happiness. An asteroid is set to collide with Earth in three weeks time and Dodges’ wife leaves him in a statement of panic. A letter soon prompts him to track down his high school sweetheart who he has never been able to forget about. Accompanying him on his road trip is Penny who has her own personal baggage that she is trying to deal with. The film’s success sits on the shoulders of Steve Carrell. Which, lucky for him, this is a character he has played before and found success with. A sad some what depressing man, who can give this look like he is opening up his soul and inside is a person who does not deserve any of the pain he has received. “40 Year Old Virgin”, “Dan in Real Life”, “Crazy. Stupid. Love.” All films that saw variations of this characters. Certainly not a bad thing, Carrell easily takes the weight of the film and carries it to the delight of the audience. While Carrell is the star, he has a slew of top notch comedy talents that all make appearances. The film is very serious for the most part, but it does take some occasional much needed breathers. Adam Brody, Rob Corddry, Patton Oswalt, and TJ Miller all provide breaths of comedy that keep this film from being a somber affair. Overall, the film is what you would expect it to be. It doesn’t take any unexpected twists. It moves along well, balancing between making the audience laugh and putting them on the cusp of tears. Director and screenwriter Lorene Scafaria turns in a very good directorial debut. Her previous writing credits include “Nick and Norah’s Infinite Playlist” which is another very enjoyable indie film. I look forward to seeing what she has to offer next.